There were 16 closed sales in Piney Orchard this month, down from the same period in 2016. Days on market remained steady at 44 and only 22 new homes came on the market helping to keep the inventory levels balanced. We usually see a substantial uptick in sales closed in August as home buyers prepare for the new school year in new homes but for some reason this just didn't happen this year. Requests from home buyers stayed steady but they didn't follow through to close making this month a bit of an anomaly. Curious about the value of your Piney Orchard home? Contact us for a free market value analysis and information on our marketing plan! 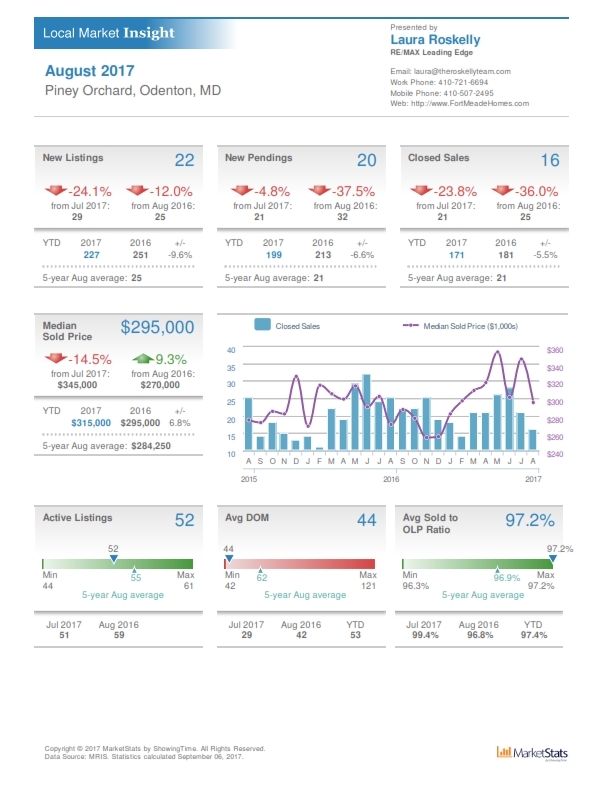 Buying a home in Piney Orchard? Start your search here and contact us for free, expert buyer representation.